You can generate a batch of billing statements, review any of the statements, and then print all or only specific statements. On the Home menu, under Reports, click (or tap) Billing Statements. The Billing Statements page opens, and the Generate Billing Statements dialog box appears. Minimum guarantor portion to bill - To generate billing statements only for accounts with a guarantor portion that is greater than or equal to a certain amount, type the desired dollar amount (0.01 or greater). To not filter by a minimum guarantor portion, type 0.00. Skip accounts with claim pending - To generate billing statements for only those accounts that do not have an outstanding claim, select the check box. To generate billing statements for accounts with and/or without an outstanding claim clear the check box. Guarantor last name - To generate billing statements only for accounts with a guarantor whose last name begins with a letter in a specified range, select a letter for the start of the range and a letter for the end of the range. To use an open-ended range, leave All selected in either of the lists, and select a letter from the other list. To not filter by guarantor last name, leave All selected in both lists. Payment Plans - Select whether to generate billing statements for accounts with and/or without a payment plan. From Last Zero Balance - Select this option to include transactions that were entered on an account's ledger since the account last had a zero balance. Other - Select this option to include transactions that were entered on an account's ledger since the date you enter. The current date is entered by default, but you can change the date. Note: On each statement, a balance forward amount will appear for the corresponding account's balance up to the specified date. Include credit card payment options - Select this check box to have credit card payment options appear on statements. Include due date as - Select this check box to have the specified date entered as the due date on statements. Only generate statement if not billed since - Select this check box to generate billing statements only if a statement has not been generated for an account prior to the specified date. By default, this filter uses today's date, but you can change it to a different date. This filter is especially useful if you want to send statements frequently, if not daily, but want to make sure that you're not resending a statement inside of a billing cycle time frame. Leave the default billing statement message for the current location entered. The message will appear at the bottom of all billing statements that are generated. If there is no billing statement mesage entered, enter the message that you want to have appear at the bottom of all statements that are generated during the current print session, or leave it blank to not have a message appear. Change the existing billing statement message to have that text appear at the bottom of all statements that are generated during the current print session. Clear the text to not have a billing statement message appear during the current print session. If you have made any changes to the billing statement message (or if there is not a message) and want reset the text back to the system default, click (or tap) the Reset to default link. If you have made any changes to the billing statement message and want to save the text as the new default billing statement message for the current location, have the Save message as default statement message check box selected when you click (or tap) Generate. 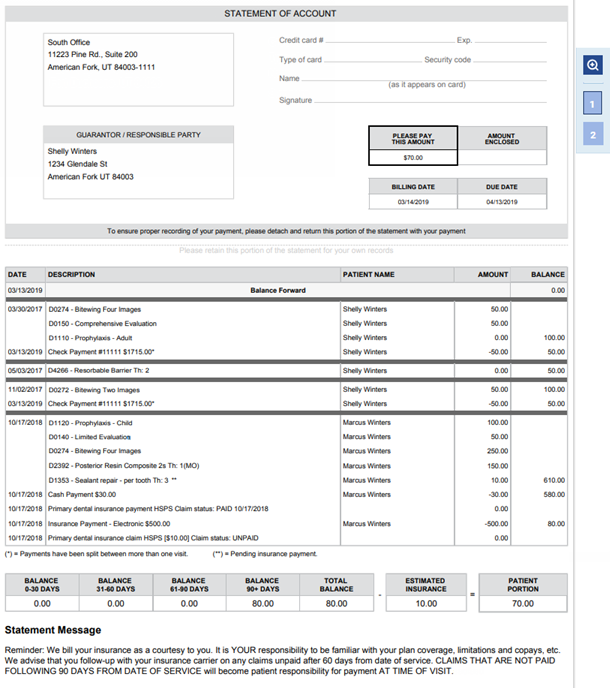 There is no limit to the length of the billing statement message, but (depending on the number of procedures and the length of the message) all of the message's text might not fit on the last page of the printed billing statement. As the billing statements are being processed, you can navigate to another part of Dentrix Ascend at any time; the processing of the statements will continue. While the statements are being processed, no other user can access the Billing Statements page. If a user attempts to do so, an error message will appear and display your user name to indicate that you are currently generating statements. When the batch of statements has been generated, a list of guarantors for the statements that were generated appears. Next to each guarantor's name is the amount of the corresponding statement. Also for your reference, the following information appears near the top of the page: the date that the batch of statements was generated, the number of statements in the batch, and total dollar amount for those statements. Note: To change the statement date, message, and/or payment options after you have generated the batch of statements, click (or tap) Generate Statements, and then repeat steps 2 - 3. Select the name of any guarantor listed to view the corresponding billing statement. If the statement is longer than one page, click (or tap) the Page Number button that corresponds to the page that you want to view. To toggle between viewing only the statement and viewing the statement and the list of guarantors, click (or tap) the Zoom button . For any guarantor who you do not want to receive a billing statement, clear the corresponding check box. Note: As you clear and select the check boxes of guarantors in the list, the Selected and Total due figures near the top of the List of Patients are updated automatically to reflect your selections. While you are viewing the Billing Statements page, no other user can access the page. If a user attempts to do so, an error message will appear and display your user name to indicate that you are currently reviewing statements. 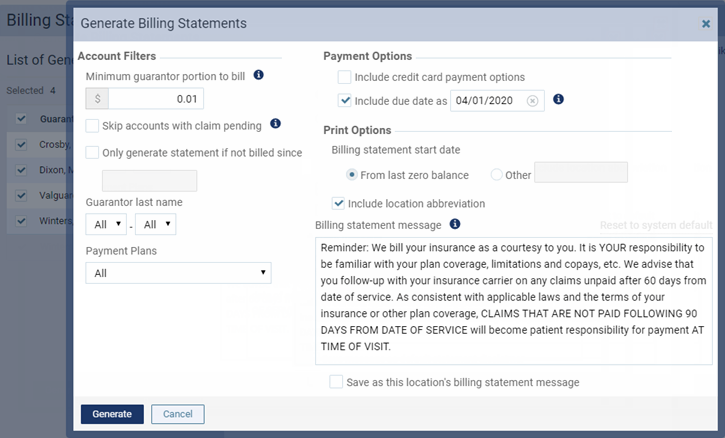 If you navigate to another part of Dentrix Ascend at any time during the review, the state of the review (the settings that you have specified, all of the statements in the batch, and which statements are selected for printing) is saved for the next time you return to the Billing Statements page or until you generate a new batch of statements. For each statement that is to be printed, to record a summary of that statement in the connections history and save a copy of the statement in the Document Manager for the corresponding guarantor and for any other patients whom he or she is the guarantor for, set the Add to Patient Connection switch to Yes. To not record the statements as patient connections or save copies of the statements, set the switch to No. Note: With this swtich set to Yes, for each statement generated, the "last billed date" for the corresponding guarantor and all patients who have that guarantor is updated, which affects which statements get generated if you generate a batch of statements in the future using the Only generate statement if not billed since option. Click (or tap) Print Selected. One .pdf file that contains all of the selected statements is created and opens in a new browser tab or window so that you can print those statements. Each statement starts on a new page of the document, and a statement may be longer than one page. Printed statements fit in #9 single- and dual-window envelopes and #10 single-window envelopes. Why are two billing statements printing for the same family? Please remove the patient phone number from the address box at the top. It can be seen when using statement mailing envelopes. When using the statement paper with the tear away top portion, it should include an area for credit card information and the balance due for the patient to mail it back. Thank you for your suggestion. I have created a new feature/suggestion in the Feature Request forum. Good suggestion. I added it to the "feature request" forum. Click here to see the entry.